Renuka Ramnath founded Multiples in 2009 and looks to build Multiples as a platform to channel long-term capital to create valuable enterprises and successful entrepreneurs. Multiples is an India-focused investment advisory firm that manages US$1 billion of Private Equity Funds. One of the most experienced private equity fund managers in India, Renuka has a full cycle track record of investing capital raised from global Institutions. 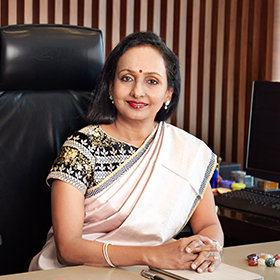 As the founder and CEO of Multiples, a dedicated India focused private equity fund with an AUM of close to USD One billion, she has over the course of three decades in financial services, successfully built several businesses. Under the leadership of Renuka, the young independent platform of Multiples has some stellar successes such as its leadership role in India’s pioneer power exchange Indian Energy Exchange, consolidation play in PVR, the cinema exhibition company and build out of a new platform for affordable housing finance company in Vastu. Renuka started her career with the ICICI Group including stints in investment banking and e-commerce; she led ICICI Venture as its MD & CEO, to become one of the largest private equity funds in India, scaling the proprietary platform from USD 50mm to USD 2.5bn under her management in 8 years. In the Indian PE market, she has pioneered first-to-market transactions like leveraged buyouts and management buyouts as well as incubated several companies. She has been frequently recognized in lists of ‘Most Powerful Women’ by several leading magazines such as Business Today, Economic Times, Forbes over the years. She is active in different industry forums in the country to pioneer the importance of Private Equity and Alternate assets. Renuka is an independent director on numerous Boards: Tata Communication Limited (Chair) – the first woman professional Chairperson in the Tata Group of companies, Ultratech Cement Limited and L&T Technologies Limited other than being on the Board of Multiples’ Portfolio Companies. Renuka thrives on the challenges that markets and competition throw in the business, consistently finding ways to succeed by deploying the full human potential to deliver extraordinary returns.